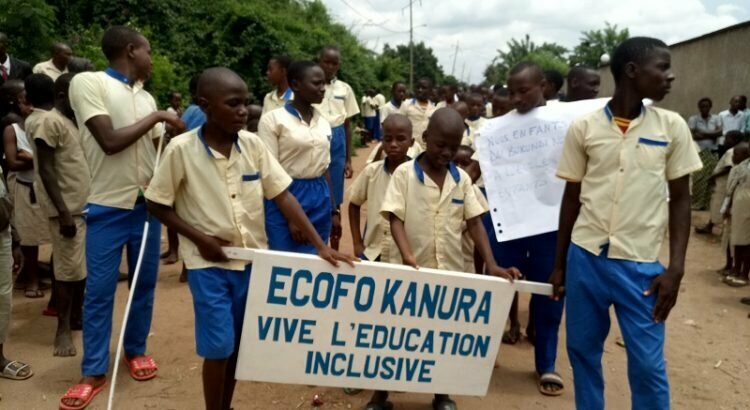 BUJUMBURA March 26th (ABP) – “Education for disabled children is a right and not a privilege, remove all obstacles” is the theme that motivated on Wednesday March 21, 2018 at Kanura basic school located in Gihanga Bubanza province , the international Day “Pull the communication cord”. Indeed, the day is a global initiative launched by the Liliane Foundation, a Dutch law organization working to promote the inclusion of children and young people with disabilities around the world, but especially in developing countries. It consists of an advocacy campaign with governments for the inclusive education of children with disabilities. The ceremonies marking the day began with an extraordinary and spectacular parade of students and pupils led by their teachers to the rhythm of brass bands. 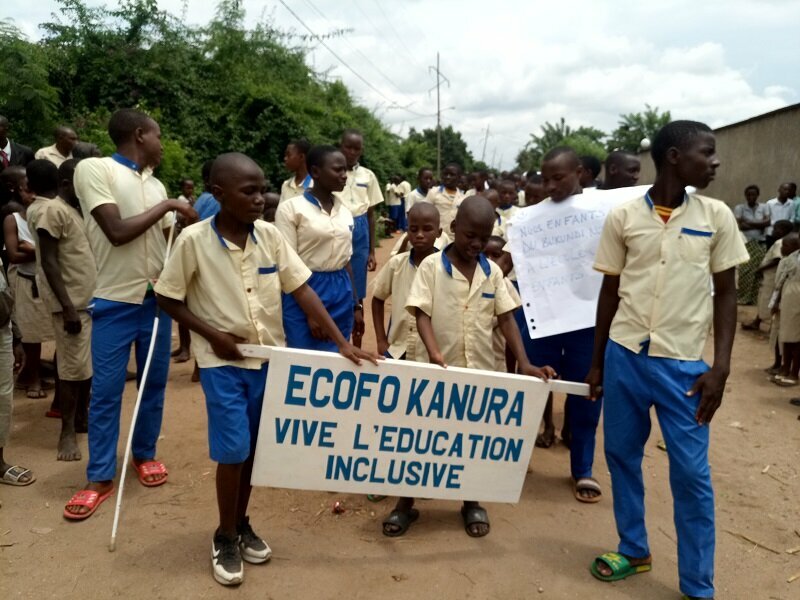 The disabled and the non-disabled in common, they waved banners on which one could read “Disabled children are welcome to school”, “Zero exclusion to education”, “We disabled children of Burundi, we want to go to school like other children, “and many others. The said ceremonies were marked by the activity, “Pulling the communication cord”, the latter consists of observing a cemetery silence standing, someone counts from 10 to zero, and arrived at zero, everyone makes a noise with sound objects and those who do not have those objects use their mouths screaming. The gesture is done for a minute. This action is symbolic and meaningful. According to pieces of information received on site, there is 1 to zero to indicate that a child living with a disability faces difficulties of any kind. According to the same sources, the entire community has to do something to get the disabled child out of those difficulties and reduce them to zero. It is up to the government, the community, local and international organizations to carry out large-scale actions in favor of the education of the latter, said the same sources. The Kanura Basic School is a school where disabled children study together with non-disabled ones. Teachers of the school approached said that the task is not easy at all but they try, as best they can, to do everything possible to save the souls of those children thirsty for the desire to be at school in front of the other with no disabilities. In his speech, the legal representative of the Emmanuel churches, one of the organizers of the day, said that in Burundi children with disabilities do not go to school for three reasons, including the inaccessibility of classes and toilets, unsuitable curricula and negative attitudes related to prejudice. That is why, he added, 9 out of 10 children with disabilities do not go to school, 33,000,000 children with disabilities do not attend school around the world and especially in developing countries. Mr. Maurice Murishi indicated that it is in that context that the campaign of advocacy for inclusive education was organized in Burundi through the action “Pull the communication cord”. “The education of a child living with a disability is not at all a charitable action in favor of the latter but it is a right that he must acquire without any conditions”, according to Ms. Adelaïde Nyigina, the legal representative of the Burundian Union of People with Disabilities (UPHB). In addition, Ms. Nyigina thanked the President of the Republic of Burundi, Mr. Pierre Nkurunziza, for having promulgated the law governing people with disabilities. On her part, Ms. Jacqueline Nicintije, Deputy Coordinator of the Inclusive Education Unit at the Ministry of Education said the government has already embraced the inclusive education of children with disabilities. It will do all the best to support both local and international organizations to improve the schooling conditions of those children.